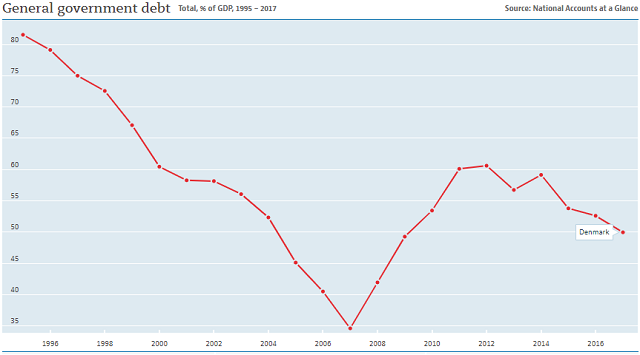 Source: Figures supplied to eurostat by the Danish Government to comply with the Maastricht Treaty on gov gross debt. Denmark’s national debt is measured as all government debt. This includes any debts accrued by local government as well as the central government. Denmark has a very low national debt but the exact amount varies according to the calculation used. According to the IMF, at the end of 2017, Denmark’s gross national debt to GDP ratio was 36.5%. At the same time, the country’s net debt to GDP was only 16%. When the net debt is a lot lower than gross debt, you can assume that the country runs a pension fund for its national pension scheme. Some, countries, such as the UK, don’t save money in a fund to create an income for the pension scheme, but pay current pensions straight out of the annual budget. Net debt is gross debt minus any assets that the government holds. The OECD measures national debt differently, including all public debt. Their calculations for 2017 put Denmark’s gross debt to GDP ratio at 50%. That 13.5% difference between the OECD figure and the IMF figure is accounted for by the debts of the non-governmental public sector. That includes state-owned enterprises and government guarantees for loans issued by key industries. Denmark’s Central Bank come up with a much lower figure when it calculates the nations national debt. That institution only counts the debt of the central government and only debt that is represented by government securities, such as bonds and Treasury bills. The central bank calculates Denmark’s gross national debt as 21% of GDP. Therefore, it can be deduced that the difference between the central bank debt to GDP figure and that of the IMF is accounted for by local government debt, which amounts to 15.5% of GDP. The central bank figure includes debt borrowed on behalf of state-owned enterprises. The bank reports that the split between central government debt and that of state-owned enterprises, allocates a debt to GDP ratio of 16% to the government and 5% to those state-owned enterprises. The different methods used to calculate national debt shows that the answer to the question of how much does Denmark owe is not so simple. Is Denmark’s national debt rising? The chart below comes from the OECD. It shows the recent history of Denmark’s national debt. 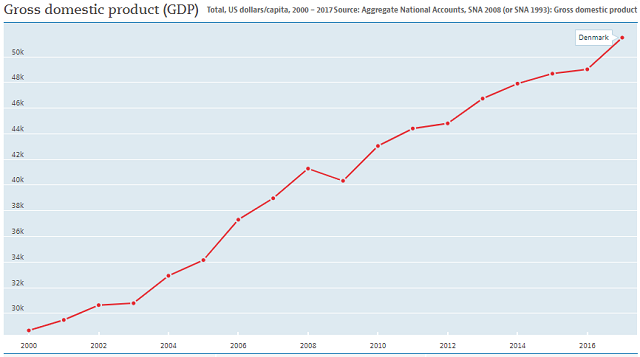 The government did a good job of reducing the national debt until the year 2008 when the global banking crisis occured. That event caused the national debt to rise again and since 2012 it has come back under control. 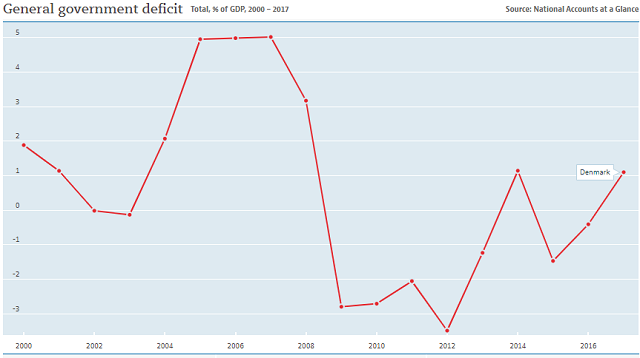 Although the government managed to get its spending under control, the budget surpluses produced by the Danish governments in 2014 and 201 are not large enough to account for the rapid reduction in the country’s debt to GDP ratio in recent years, especially since the government ran a deficit in 2015 and 2016, which would have added to central government debt. The reason that Denmark’s debt to GDP ratio began to fall again in 2012 is because the Danish economy has shown strong growth. The chart below shows Denmark’s GDP per person. The effects of the 2008 banking crisis only dented the country’s income in one year. Ever since 2009, the economy has continued to grow, helping the banks of Denmark recover and staving off disastrous unemployment, which increases government spending. The increasing wealth of Denmark has helped to reduce its debts as a proportion of GDP. Who manages Denmark’s national debt? The Danish government’s Ministry of Finance has the ultimate responsibility for managing the national debt. The Ministry has direct control over central government borrowing, but can also control local government borrowing through legislation in the parliament (Folketing) and can control the debt growth of state-owned enterprise by command. The Ministry does raise debt itself. That task has been contracted out to Danmarks Nationalbank, the Danish National Bank. The bank has a special department, which takes care of all work related to the central government’s debts. This is called the Government Debt Management Office. As well as raising funds for the government, the bank manages three government funds. These are the Social Pension Fund (SPF), the Advanced Technology Foundation and the Fund for Better Working Environment and Labour Retention. These three funds account for those public assets that make the Danish net national debt so low. How does the Danish government raise loans? When the Danish government needs some money from from debt, rather than going to a bank for a loan, it issues securities through the market. The Danish National Bank performs this task on behalf of the government. All government securities are sold through auctions. The auctions are not open to all. The bank will only accept tenders for part of an issue of securities from a group of approved buyers. These approved businesses are called Primary Dealers. Anyone else can buy and hold Danish government securities. However, they are not allowed to buy them directly from the Danish National Bank. Large buyers of securities can contact a Primary Dealer and arrange to buy an allocation from an auction, with that dealer acting as an agent. All other buyer need to go to the secondary markets. Primary Dealers do not always have all of the allocations that they buy pre-sold, and so they resell those securities on the debt and money markets. What government securities does the Danish National Bank sell? The Danish government needs money to cover day-to-day expenses. When tax receipts don’t arrive at a regular pace, the government needs to cover those income gaps with debt. Long-term projects need to be financed differently. The Danish National Bank borrows money on behalf of the government in two different ways. ​The Skatkammerbeviser is the Danish government’s way of borrowing over the short term. These devices never have maturities of more than a year. The format of the Skatkammerbeviser is that of a Treasury bill. This is the standard method of short-term borrowing used by just about every government in the world. These instruments do not pay interest. However, they are sold at a discount and redeemed at full face value. The difference between the value of the bill and its discounted price provides the trader with a profit. The nominelle obligationer is the classic government benchmark bond. These bonds pay a fixed interest every year and are redeemed in full at the maturity date. The maturity periods of these bonds are always longer than a year. The Inflationsindekserede obligationer is an index-linked bond. The capital amount of these bonds is adjusted each year in accordance with the countries Consumer Price Index. The bonds pay a fixed interest rate each year. However, as the capital amount of the bond increases, the actual interest payment will increase, too. These bonds also always have maturities of more than a year and the Danish National Bank pays out the inflation-increased value of the bond on the maturity date. What facts should you know about Denmark's national debt? You could wrap $1 bills around the Earth 494 times with the debt amount. If you lay $1 bills on top of each other they would make a pile 13,849 km, or 8,605 miles high.